Hillary Clinton lambasted Donald Trump at packed rallies in Silicon Valley and San Francisco Thursday. Speaking to a couple thousand supporters at Parkside Hall in San Jose, the Democratic presidential frontrunner picked apart the presumptive Republican presidential nominee's views on immigration, foreign policy, nuclear weapons and a tax plan that was created "by a billionaire for billionaires." She also slammed his refusal to release tax returns. "He roots for himself, not for you," Clinton said, accusing Trump of seeking a "good result for himself," without a care for "who gets hurt in the process." Responding to news that as of Thursday Trump has picked up enough delegates to clinch the GOP nomination, Clinton said President Obama, who is currently attending a G-7 summit, reported that world leaders are "rattled" by what Trump says, promotes and stands for. She urged attendees to vote in the upcoming California primary and encourage others to do the same so a "loose cannon" like Trump "never gets close to the White House." A presidential candidate's value is based on the ability to produce results, protect citizens as Commander-in-Chief, and unify the country, Clinton said. "Donald Trump fails every one of those tests." Despite joking that presidential hopefuls single out nearly every election as being "most important," Clinton stressed, "I happen to think every election is important, but, you know what, this is the most important election because we've got some big decisions to make as a country." Clinton's fans flocked to the South Bay venue hours before she took the stage around 2:30 p.m., while a small group of protestors took up their post outside and one heckler made his way into the crowd. Rally signs bobbed up and down on the sidwalk, reflecting the dozen or so protestors' desire to "Say No to War," "Say No to Wall Street," "Say No to Prison Lobby," and "Say No to Super PACs." They also urged "Peace and Prosperity For All" and asked "Where's Our Debate?" — likely in response to Clinton's decision not to debate fellow Democratic hopeful Bernie Sanders before the high-stakes June 7 primary. Clinton said Thursday that she was proud of the positive and issues-based campaigns run by Sanders and herself. 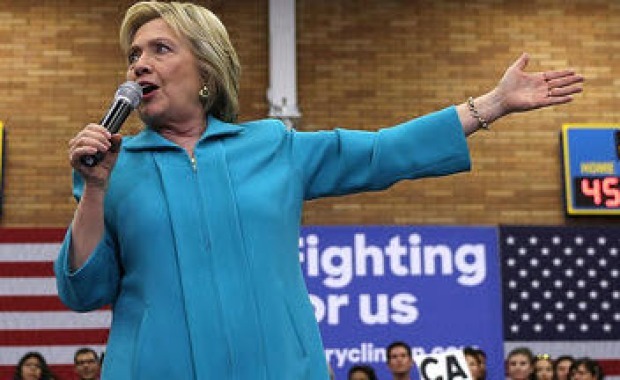 With less than two weeks to go before the high-stakes California primary, Hillary Clinton is campaigning at full speed in the Bay Area, with two pit stops slated for Thursday. Jean Elle reports. The former Secretary of State was introduced by Lt. Gov. Gavin Newsom, Assemblyman Evan Low (D-Silicon Valley) and San Jose Mayor Sam Liccardo, among others. "The other guy wants to build a great wall. With Hillary Clinton, we will build a great country," Liccardo said. Describing Clinton as "a dreamer and a doer," Newsom also lauded her desire to build bridges, not walls. He pointed out Clinton does not mistake climate change for a "hoax" and "understands that a great society does not make it harder to vote than to buy an assault rifle." In San Francisco, where a line snaked around the Jones Street building before the boisterous event, Clinton was ushered onto the stage after Board of Supervisors president London Breed, Mayor Ed Lee and Newsom backed her. Clinton highlighted plans to simultaneously combat climate change and earn the United States the honor of being the first "clean energy superpower." If elected, she said she plans to push to deploy half a billion more solar panels by the end of her first term, and create enough clean energy to power every household in the country by the time her second term concludes. In both speeches, Clinton lauded Silicon Valley and the San Francisco Bay Area for their entrepreneurial spirit and relentless focus on the "future." "We have to get back in the future business" by growing the economy, making it "fairer" and uplifting each other, she said. Clinton opposed Trump's proposal to spend an estimated $25 billion to build a wall on the United States-Mexico border. That money would be better spent on 1,500 new, state-of-the-art elementary schools or paying for college for 300,000 veterans, she said. Speaking in support of early childhood education, free community college and more technical education, and debt-free tuition, Clinton said, "The economy does better when we have a democrat in the White House." Clinton also came out on behalf of improving the affordable health care plan, helping people with mental health issues and addiction problems, marriage equality, commonsense gun safety reform, and women's healthcare rights. She also promised to "appoint Supreme Court justice who will overturn Citizens United." Blasting Trump for insulting women, disabled people, Muslim people, immigrants and even Sen. John McCain, a war hero, Clinton said, "Honest to goodness, there's nobody left to criticize." In conclusion, though, Clinton reminded attendees that she can't achieve any of her goals without the voters' help. "We cannot stand this kind of hate talk and demagoguery," she said. "If you will vote for me California, I will work my heart out to get you the future that we deserve." In a change of pace, Clinton plans to attend a meeting with community leaders in Oakland's Home of Chicken and Waffles at 9 a.m. Friday.